drumstick recipe collection. 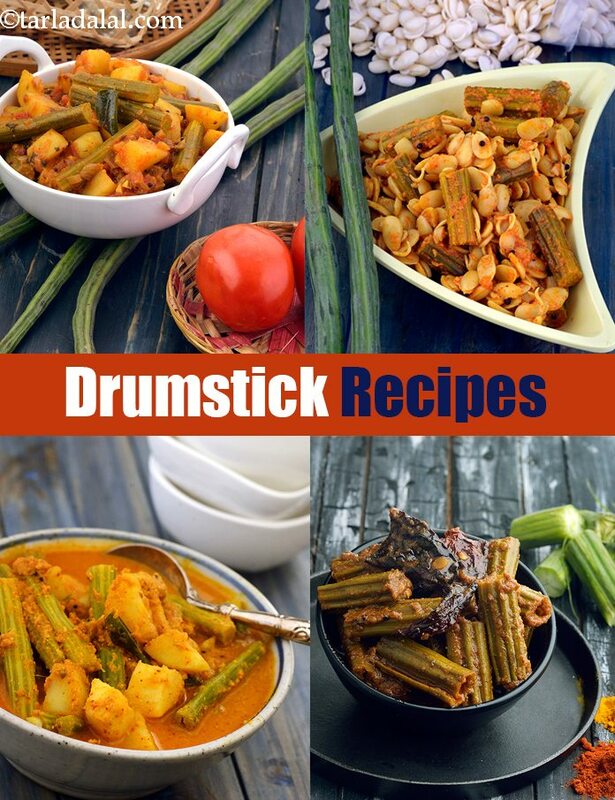 Indian drumstick recipes. Drumstick fruits are green, long and thin pods resembling an actual Drumstick. The only portion consumed is the soft, jelly-like interior in which the seeds are present. The seeds, too, are nice to eat if the beans are young. They are a popular ingredient in vegetable curries. Simmered in lightly salted water for 7-10 minutes they can be eaten as it is after removing the pulp. They are widely used in South Indian preparations like dals and curries. Sambhar made with lentils and vegetables is the most loved accompaniment for rice or dosas and idli's. Similar breakfast accompaniment is Kolumbu, a veggie-loaded dish with an assortment of masalas and dals. Different regions have different method of cooking the same ingredient. Mangalorean drumstick curry cooked with a tamarind-flavored coconut masala taste amazing with a bowl of rice or some hot rotis. The addition of drumstick to rice preparations like South Indian Mixed Vegetable Khichdi and Bisi Bele Bhaat enhances the flavour greatly. When peeled and cut into finger lengths and cooked in spicy gravy, drumstick can be transformed into appetising Drumstick Curry. Drumstick and Cashew Curry, Vegetables in Tomato Gravy, South Style Mixed Veg Curry are various recipes using drumstick. It is also one of the main ingredients in preparation of kadhis like the Bhatia Kadhi, Sindhi Kadhi. Drumstick leaves recipes like this dry sabji with a traditional tempering and a mixture of coconut and minimal spices are not only easy to cook but also, very flavourful. Apart from these traditional applications in curries, sambhar, kormas, and dals, it is a surprise vegetable, which also makes tasty pickle and soup. The mellow creaminess of vaal and the amazing flavour of drumsticks make a easy drumstick recipe Vaal Drumsticks Subzi. A simple combination of drumsticks with potatoes, onions and tomatoes for this drumstick and potato subzi recipe. Drumstick Dal is a flavourful variant to sambar. Rare is a wedding in South India without the drumstick and coconut based Avial recipe. Enjoy our drumstick recipe collection. Indian drumstick recipes given below. A variation of the traditional kadhi, this combines well with steamed rice, papad and pickles to make a wholesome, filling meal.